Low prices. OrangeSmile.com offers car hire service in Belarus on the lowest-rate-guarantee basis, since we work with car suppliers directly. For your search criteria in Belarus, we always select and show the best rental offers. The car reservation process consists of 3 simple steps: (1) search for available cars for your dates in Belarus; (2) select your car type; and (3) fill in the booking forms. Once the reservation is completed, you will receive a confirmation voucher to your email address. During the booking process, please check your rental conditions. To pick up your car at the rental point in Belarus, you need to provide our confirmation voucher, your driving license and a valid credit card. The final payment is normally carried out at the pick-up point. Our car hire points in Belarus accept VISA, MasterCard, etc - please check your rental conditions. At the pick-up point, please read the handling manual and check the car for present defects. OrangeSmile.com wishes you a pleasant journey to Belarus! The car hire reservation system OrangeSmile.com allows renting a vehicle in Belarus within 10 minutes. Our largest database of car suppliers enables us to provide you a rental car in Belarus at the cheapest rate ever possible. At rental locations in Belarus we offer the following car sizes: mini, compact, economy, standard, premium and luxury. The following car types are available in Belarus: Sedan, Hatchback, Jeep, Cabriolet, Coupe, Minivan and Minibus. The majority of cities in Belarus were founded yet in 8th – 10th centuries, so there are many places of interest, historic sights, old buildings and museums in every part of the country. Visiting them will help you get acquainted with this wonderful country and its rich heritage. 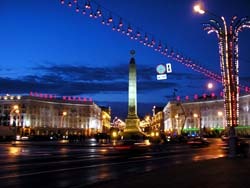 The capital of the country, Minsk, is also the biggest culture centre of Belarus. The most famous landmarks of the city include Troitskoye Predmestye, Jesuit Collegium, Kalvaryja Church, the Church of Maria Magdalena, the Church of Alexander Nevsky, the Church of Holy Trinity, the Cathedral of Holy Spirit, Mason House, Pishchalauski Castle and Loshitskij Park and mansion. Almost all of these memorial places were constructed to celebrate an important historic event. As the majority of sights in Minsk are old, they exhibit numerous ancient artefacts, priceless icons and relics, so an excursion to any of the abovementioned places will be truly interesting and educative. The most popular museum in Minsk are Belarus National Museum of History and Culture, Belarus State Art Museum, the Museum of Ancient Art, the Museum of World War II, the Museum of National Architecture and the Museum of Stones in Uruchie. In Minsk, tourists will find a diversified cultural program, but the capital is not the only city with rich heritage. The ancient city of Zaslawye is home to a large open-air museum. Tourists will find there magnificent churches, old castles and fortresses, ancient protective facilities that belong to 15th – 17th centuries. Other notable sights include the Transfiguration of the Saviour Church, “Mlyn” ethnographic complex, the Museum of Music Instruments and the Cathedral of Virgin Mary. In recent years, more and more tourists prefer to visit Nesvizh. This interesting city is mostly famous for Nesvizh Castle. The castle was built in the end of the 18th century in accordance with the project of Giovanni Bernardoni. The palace was considered one of the most beautiful buildings of its era. It was also an impenetrable fortress with thick walls and a system of protective graffs. The village of Khatyn is also worth attention of travellers. The tragic story of the village is well known around the world. In 1943 the village was burnt to ashes by the Fascists. All 149 people, who lived in Khatyn, were killed. In the memory of the dead, the great memorial complex named “the Unconquered Human” was built in the territory of the village. Other popular excursion routes in Belarus include such cities as Mogilev, Brest, Grodno, Bobruisk, and Vitebsk. If you return a damaged car in Belarus, please ask the staff to examine the car and write down all the defects found. Make sure that the document describing the defects is filled in correctly and provided to you in a printed format.